Stingless native bees are primitive species that only produce small amounts of honey. It is only in warm areas of Australia, such as in Queensland and northern NSW, that they can produce more honey than they need for their own survival. Harvesting honey from a nest in a cooler area could weaken or even kill the nest. In warm areas of Australia, however, honey production is possible with these bees. 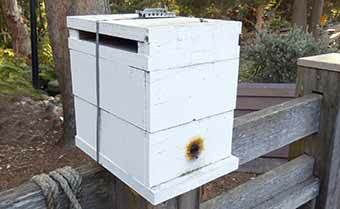 Hives also can be kept successfully in boxes in these areas and propagated by splitting. Special methods and hive designs have been developed to harvest moderate amounts of honey from stingless bees in these areas without harming the bees. 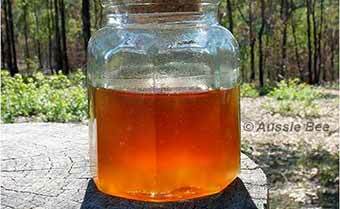 The delicious rich honey produced by Australian stingless native bees is called Sugarbag. Stingless bee honey is called Sugarbag and was prized by Aboriginals who collected it from wild nests. Stingless bees store their flavoursome honey in clusters of small resin pots near the extremities of the nest. The resin adds a wide variety of tangy flavours to the honey, such as lemon or eucalyptus. It is delicious drizzled over ice cream! However, Sugarbag honey is a rare product to be savoured because each hive only produces about 1 kg of honey per year. Australian stingless bees store their honey in little pots. When filled they look like a glowing bunch of grapes. 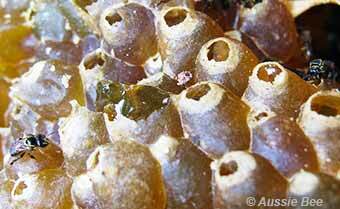 These delicate pots were built by Austroplebeia stingless bees. For honey production, the bees need to be kept in an especially-designed box so that the honey stores can be reached without damaging the rest of the nest structure. Box designs for honey production provide a separate compartment for the honey stores so that honey pots can be removed without spilling honey into other areas of the nest.